The Fairchild PT-19 (company designation Fairchild M62) was an American Fairchild Aircraft monoplane primary trainer aircraft that served with the United States Army Air Forces, RAF and RCAF during World War II. It was a contemporary of the Kaydet biplane trainer and was used by the USAAF during Primary Flying Training as the introductory pre-solo phase trainer for introducing new pilots to flying before passing them on to the more agile Kaydet. As with other USAAF trainers of the period, the PT-19 had multiple designations based on the power plant installed. Compared to the earlier biplane trainers, the Fairchild PT-19 provided a more advanced type of aircraft. Speeds were higher and wing loading more closely approximated that of combat aircraft, with flight characteristics demanding more precision and care. Its virtues were that it was inexpensive, simple to maintain and, most of all, virtually vice-less. The PT-19 truly lived up to its nickname, the Cradle of Heroes. 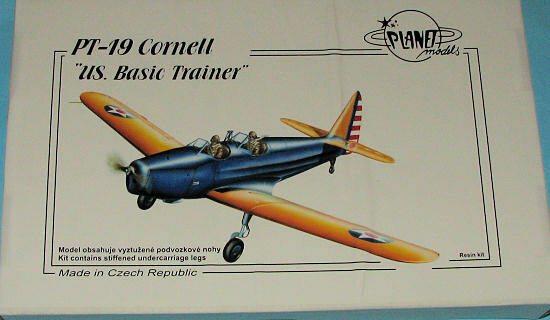 It was one of a handful of primary trainer designs that were the first stop on a cadet's way to becoming a combat pilot. Thousands of the PT-19 series were rapidly integrated into the US and Commonwealth training programs, serving throughout World War II and beyond. Even after their retirement in the late 1940s, a substantial number found their way onto the US civil register. There are 98 airworthy world-wide today. Planet Models is part of the CMK family of companie s and since CMK does a lot of resin, it isn't surprising that they do kits as well. Molded in the standard tan resin, the kit is provided in the usual segregated plastic bag to keep the somewhat brittle resin from being damaged. Small parts are included in one of the compartments as are a pair of vacuformed windscreens. The main gear legs and tail wheel are in a black plastic that is said to be reinforced. It will need to be to keep from bending under the weight of the solid, one-piece wing. The fuselage halves have detail on the inside and this is eventually topped with the cockpit opening section. The hollow engine cowling piece has a small engine front piece to place behind the cooling opening. Overall, the quality of the casting is good. I found the usual small air voids on the tips of the wings, fin and tailplanes. Not difficult to fill and reshape, but I know castings can be made without these glitches in them. There are some very fine resin castings in the 'bits bag' and I'm pleased that despite a lack of protection, these seem to have all survived the rigors or shipping. Probably the most onerous part of the build will be building up the roll over assembly from separate lengths of resin strut. Cockpit is complete enough for all but the most fastidious and while the seats have belts molded on them, some will want to remove these and use etched belts. Instructions are on two smallish sheets of paper with five large and well drawn construction steps. Color information is provided in the construction phase, including details for the seat harnesses. 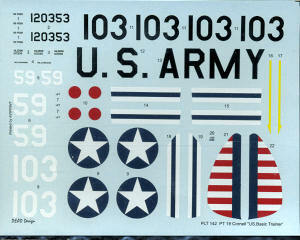 The decal sheet is well printed and provides marking for two planes. One is the box art plane from 1942 and the other is a Norwegian plane from 'Little Norway' in Canada during 1942-44. This plane has a mostly aluminum dope fuselage and the builder will have to paint large red bands on the wings as well as paint the rudder red. The blue and white portion of the insignia are provided on the sheet. OK, not inexpensive for what is essentially about as basic an aircraft as one can get. 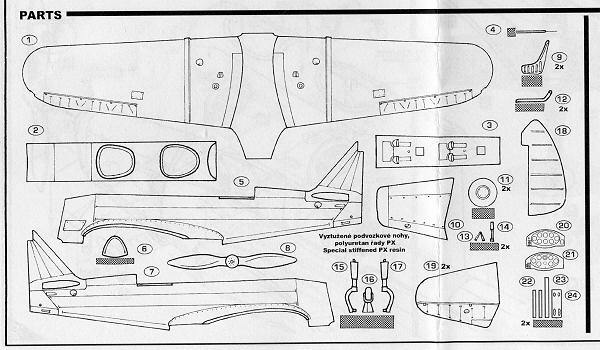 However, the PT-19 is one of those aircraft that are on many modeler's want list and now, 1/48 scale builders will have one to add to their shelves.